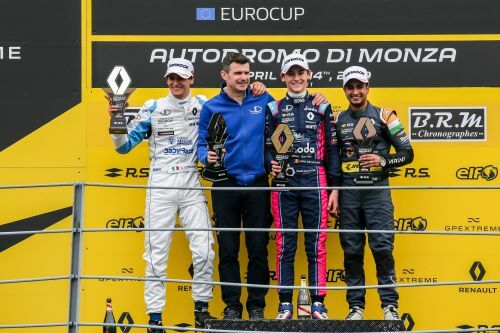 Monza, Italy, 14th April 2019: Debuting as a Rookie at the 2019 Formula Renault Eurocup Championship, Kush Maini finished 3rd overall in the season opener at the historic Monza circuit in Italy. With a stranded car out on track the organizers were forced to deploy the safety car for two laps thus bunching the field together. A sluggish getaway on the restart of the race saw Kush drop down to fourth, however, he fought back in no time reclaiming third in a matter of a few laps once again displaying his phenomenal overtaking ability, something that has become a bit of a trademark in his short career so far. While Kush did manage to close the gap on Lorandi, he was unable to pull off a move on the Italian and ultimately had to settle for third. Kush will now turn his attention to the second half of the weekend, with another qualifying session and race set to take place on Sunday.